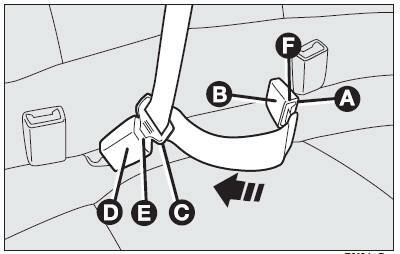 To fasten the seat belt: insert the tongue (A) into the buckle (B), until you hear it click. To unfasten the seat belt: press button (C). To adjust the belt: slide the webbing in adjuster (D). Pull length (E) to tighten the belt and length (F) to loosen it. IMPORTANT The belt is adjusted properly when it fits closely across the hips. The seat belt has two webbings and a double buckle. To fasten the seat belt: pull the webbing from your reel gently. Slide the webbing carefully through the retainer by the side of the head restraint without twisting it. Then fasten tongue (A) in buckle (B) (grey with a black button) making the two yellow spot references coincide (one on the tongue and one on the buckle). Slide out more webbing and insert tongue (C) in buckle (D) (grey with red button). 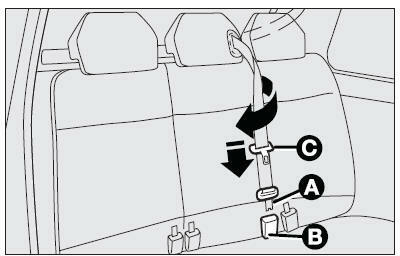 To unfasten the seat belt: press button (E) and lead the webbing to buckle (B). Then press button (F) (black).